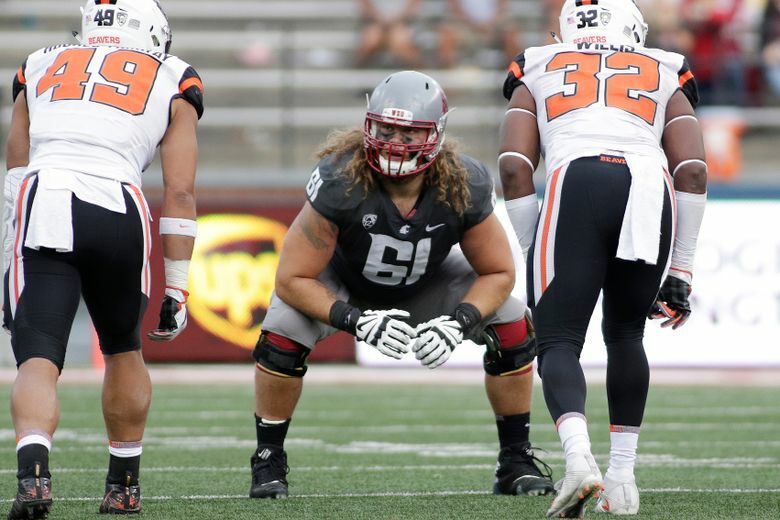 The first Washington State player drafted was not, as many expected, Luke Falk, but instead, his offensive tackle Cole Madison. The Green Bay Packers selected Madison with the first pick of the fifth round, drafting him 138th overall. Now, Madison will get to block for Aaron Rodgers, a future Hall of Fame quarterback. “The fact that they have one of the greatest quarterbacks ever in Aaron Rodgers, and they chose me to help protect him, that’s such an honor,” Madison said. Madison hosted a draft party at a downtown Seattle hotel for family and friends. WSU players Peyton Pelluer and Nick Begg drove to Seattle to watch the draft with Madison, and former Cougar Colton Teglovic was also at Madison’s party. He’d been checking his phone incessantly for a couple of hours when it finally phone at about 11 a.m. and a Wisconsin area code flashed on the screen. Madison started 47 games for WSU at right tackle, but will likely transition to offensive guard in the NFL, though, he says the Packers did not specify over the phone where they want him to play. Getting that phone call from Green Bay was particularly surprising for Madison because he hadn’t heard much from the Packers in the pre-draft process. The 6-foot-5, 308-pound Seattle native went to WSU as a tight end, but switched to offensive line early during his freshman year. Madison is the only offensive lineman the Packers have drafted through five rounds. Madison is the first WSU offensive lineman drafted since the Detroit Lions took Joe Dahl in the fifth round, 151st overall, in the 2016 NFL draft.